We use bitter melon/bitter gourd for making curry. We boil bitter gourd in water couple of times to remove bitterness which is very time consuming. Is there any better way to remove bitterness? Some people claim you can reduce the bitterness of eggplant by slicing it then salting the slices, wrapping in a clean cloth, and putting some weight on it. The salt draws out moisture. It's possible a similar technique would work with your bitter melon, although I had never heard of it before your question. It might not save much time, but you wouldn't have to watch them while doing the salt treatment. 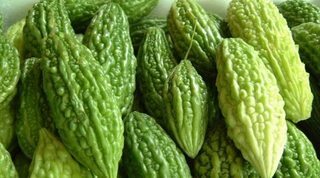 My mom uses this technique with cucumbers and bitter melon. Slice off the tip of the bitter melon. Then put the tip back on. Now rub the cut surfaces together in a circular motion. This draws out the moisture and bitterness from the cucumber and bitter melon. I also heard that the longer you cook the bitter melon, the more bitter it will taste. So boiling it many times may actually make it taste more bitter. Not the answer you're looking for? Browse other questions tagged fruit asian-cuisine indian-cuisine melon or ask your own question. Why is my icecream bitter? Is thick fruit skin safe to be eaten? Why to remove skin and seeds of tomatoes when we puree them? What is the purpose of adding curry leaves? What's the best way to cut strawberries to consistent thinness, for dehydrator? How to efficiently separate bad from good pomegranate arils? How can I improve my chicken curry recipe?